The new Interact With The Pack Virtual Photo Experience featuring Jordy Nelson, Randall Cobb, David Bakhtiari and Bryan Bulaga is available to fans at all home games. GREEN BAY, Wis. – September 5, 2017 – With the start of another football season, Packers fans have new, exclusive opportunities to show their pride and receive unprecedented access to their favorite team through Associated Bank. 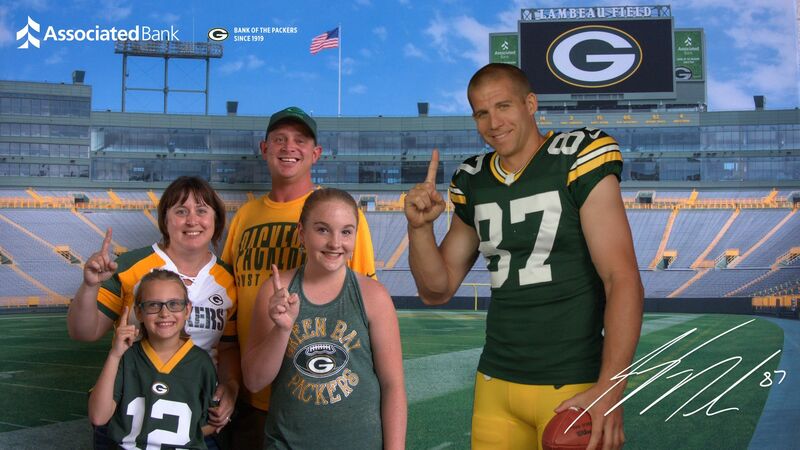 This season’s “Get Closer to the Packers” campaign features interactive in-stadium, online and community activities, and an opportunity to win a one-of-a-kind behind-the-scenes experience. Fans are invited to a new Virtual Photo Experience featuring Jordy Nelson, Randall Cobb, David Bakhtiari and Bryan Bulaga. With their chosen player, fans can participate in a unique augmented reality experience and pose for a photo with that player. The photo includes the player's autograph and will be sent to the fan’s email so they can download it or share via their Facebook and Twitter accounts. This fan experience is located in the Lambeau Field Atrium and the Johnsonville Tailgate Village in the Lambeau Field parking lot. Associated Bank’s business partners will benefit from the campaign through thought leadership insights, exclusive events with access to players and executives and unique on-field experiences. * Visit https://www.associatedbank.com/Packers for terms and conditions. ** Offer expires March 31, 2018. To qualify for the $75 Packers Pro Shop gift card, customer must open a new Packers Checking account at Lambeau Field. Customer will receive a voucher which can be taken to any Associated Bank location to fund the account. $100 minimum deposit required. Please allow two-four weeks for fulfillment of the Packers Pro Shop gift card. Once gift card is in customer’s possession, Associated Bank is not responsible for lost or stolen gift cards. Gift cards are nontransferable and are not redeemable for cash. Associated Banc-Corp (NYSE: ASB) has total assets of nearly $30 billion and is one of the top 50 publicly traded U.S. bank holding companies. Headquartered in Green Bay, Wisconsin, Associated is a leading Midwest banking franchise, offering a full range of financial products and services from over 200 banking locations serving more than 100 communities throughout Wisconsin, Illinois and Minnesota, and commercial financial services in Indiana, Michigan, Missouri, Ohio and Texas. Associated Bank, N.A. is an Equal Housing Lender, Equal Opportunity Lender and Member FDIC. More information about Associated Banc-Corp is available at www.associatedbank.com.